Please don't call or ask us if the price quoted was "our best price". 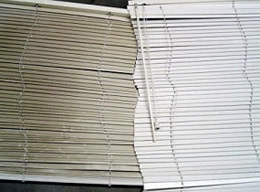 All of the members of our team quote numbers according to our established pricing chart based upon the size, types and number of blinds, shades or draperies in the information provided to us. We don't play pricing "games" or use "sales gimmicks". If you want someone to quote high and then try to entice you to to do business with them by offering "today's special" or "website discount coupons" we aren't the folks to call. We strive to provide our clients with the best value for the service provided. Spending the time to mind the details and doing a job correctly and to the best of our ability means our prices may not always be the "cheapest". Our team of professionals take pride in their work and value the warm relationship we share with many of our long term clients. We stand behind our work and reputation. 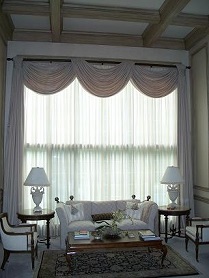 We provide clients with service as personalized as their window treatments. Basic Drop Off - You bring them to us. We clean them. $$ Weekdays (9-1 week days and usually 8-4:30 depending upon the day's appointments) Saturday 10 - 1 p.m.
Not sure we service your area? Ask for a referral to a professional blind cleaner that services your area.